Catalog - Arresters - Surge/Lightning, Maxwell Lightning Protection Co. 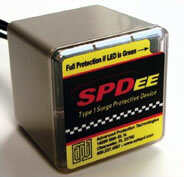 Single phase surge protection devices are suitable for residential, light commercial, and subpanel applications. Three phase surge protection devices are suitable for commercial and light industrial applications. In addition to the items shown a wide array of products are available. Contact ECLE with your particular specifications and we will assist with product selection.